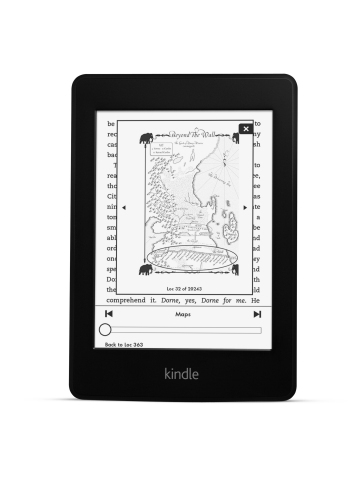 SEATTLE--(BUSINESS WIRE)--Sep. 3, 2013-- (NASDAQ: AMZN)—Today, Amazon announced that the world’s best-selling e-reader—Kindle Paperwhite—is getting even better. The all-new Kindle Paperwhite features new display technology with higher contrast, the next generation built-in light, a faster processor, the latest touch technology, and exclusive new features designed from the ground up for readers. Kindle Paperwhite is available for pre-order starting today at http://www.amazon.com/kindle-paperwhite and http://www.amazon.com/kindle-paperwhite-3g. Kindle Paperwhite combines the best hardware, massive selection, lowest book prices, best reading features, best customer service, personalized recommendations, customer reviews, and more—into one seamlessly integrated service for customers. This is the reason Kindle owners read four times as many books—print and eBooks—as they do prior to owning a Kindle. New display technology with higher contrast—Kindle Paperwhite’s display is the most advanced e-reader display ever constructed. Higher contrast and better reflectivity means whites are whiter and blacks are blacker, so the pages are virtually indistinguishable from a physical book. You won’t find this level of contrast with any other e-reader display. New Kindle Page Flip—Skim page-by-page, scan by chapter, or skip to the end of your book, all without losing your place. For example, it’s now easy to quickly flip back and forth to that map of Beyond the Wall in A Dance With Dragons. See a screenshot: www.amazon.com/kindle-page-flip. New Goodreads Integration—Combines the world’s largest e-reading community and the world’s largest community of book lovers. Join over 20 million other readers and see what your friends are reading, share highlights, and rate the books you read with Goodreads on Kindle, available exclusively from Amazon. See screenshots: www.amazon.com/kindle-goodreads. New Kindle FreeTime—Built-in parental controls have been extended to give parents a simple, engaging way to encourage kids to spend more time reading. Hand-select books for your kids to read, and hand out achievement badges when they hit reading milestones. A progress report keeps parents updated on total time spent reading, number of words looked up, badges earned and books finished. See screenshots: www.amazon.com/new-kindle-freetime. New Vocabulary Builder—Compiles words you look up in the dictionary into an easy-to-access list. Use these lists to quiz yourself with flashcards and instantly see words in context. See screenshots: www.amazon.com/kindle-vocabulary. New Smart Lookup—Integrates a full dictionary definition with other reference information about a word, character, topic or book via X-Ray and Wikipedia. For example, using an ordinary dictionary to look up “credit default swaps” in Michael Lewis’ The Big Short would give the individual definitions of “credit,” “default” and “swaps.” Smart Lookup recognizes this is an important topic and phrase in the book, and gives you the correct definition of “credit default swaps” via X-Ray. See a screenshot: www.amazon.com/kindle-lookup. New In-line Footnotes—With a single tap, read the complete text of each footnote in-line without changing the page or losing your place in the book. See a screenshot: www.amazon.com/kindle-footnotes. New Kindle MatchBook—New benefit lets customers purchase Kindle editions of print books purchased from Amazon—past, present and future—for $2.99 or less. The new Kindle Paperwhite is only $119. Kindle Paperwhite is available for pre-order starting today at www.amazon.com and begins shipping September 30. The new top-of-the-line Kindle Paperwhite Wi-Fi + 3G is only $189. Customers can sign up to be notified when Kindle Paperwhite Wi-Fi + 3G is available for pre-order at www.amazon.com. Kindle Paperwhite Wi-Fi + 3G is expected to ship November 5. For high resolution images and video of the new Kindle Paperwhite, visit www.amazon.com/pr/kindle. Amazon.com, Inc. (NASDAQ: AMZN), a Fortune 500 company based in Seattle, opened on the World Wide Web in July 1995 and today offers Earth’s Biggest Selection. Amazon.com, Inc. seeks to be Earth’s most customer-centric company, where customers can find and discover anything they might want to buy online, and endeavors to offer its customers the lowest possible prices. Amazon.com and other sellers offer millions of unique new, refurbished and used items in categories such as Books; Movies, Music & Games; Digital Downloads; Electronics & Computers; Home & Garden; Toys, Kids & Baby; Grocery; Apparel, Shoes & Jewelry; Health & Beauty; Sports & Outdoors; and Tools, Auto & Industrial. Amazon Web Services provides Amazon’s developer customers with access to in-the-cloud infrastructure services based on Amazon’s own back-end technology platform, which developers can use to enable virtually any type of business. Kindle Paperwhite is the world’s best-selling and most advanced e-reader. It features new display technology with higher contrast, the next generation built-in light, a faster processor, the latest touch technology, and exclusive new features designed from the ground up for readers. Kindle, the lightest and smallest Kindle, features improved fonts and faster page turns. Kindle Fire HD features a stunning custom high-definition display, exclusive Dolby audio with dual stereo speakers, high-end, laptop-grade Wi-Fi with dual-band support, dual-antennas and MIMO for faster streaming and downloads, enough storage for HD content, and the latest generation processor and graphics engine – and it is available in two display sizes – 7” and 8.9”. The large-screen Kindle Fire HD is also available with 4G wireless. The all-new Kindle Fire features a 20% faster processor, 40% faster performance, twice the memory, and longer battery life. Amazon and its affiliates operate websites, including www.amazon.com, www.amazon.co.uk, www.amazon.de, www.amazon.co.jp, www.amazon.fr, www.amazon.ca, www.amazon.cn, www.amazon.it, www.amazon.es, www.amazon.com.br, amazon.in and www.amazon.com.mx. As used herein, “Amazon.com,” “we,” “our” and similar terms include Amazon.com, Inc., and its subsidiaries, unless the context indicates otherwise. The 3G device has not been authorized as required by the rules of the Federal Communications Commission. This device is not, and may not be, offered for sale or lease, or sold or leased, until authorization is obtained.